This spring, greenSTEM is delighted to have guest bloggers! 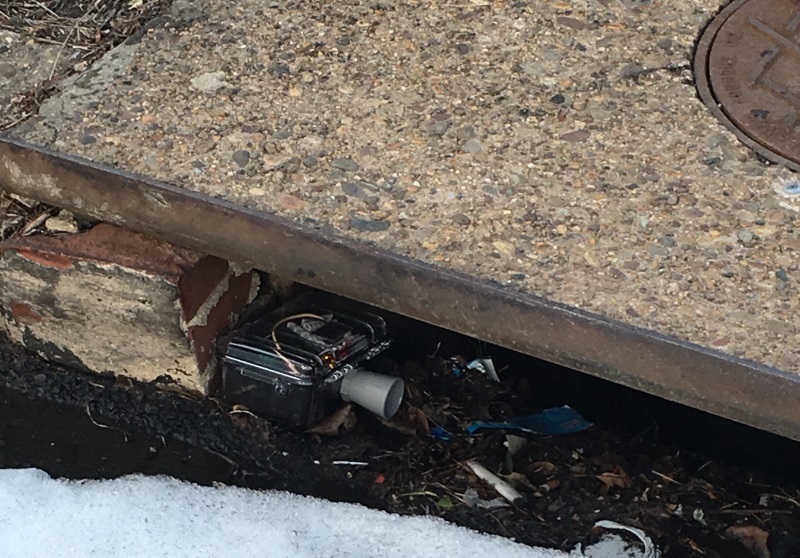 We’re working with the Fairmount Water Works and high school students from SLA Beeber to create a smart green roof model using microcontrollers and sensors. After researching green roofs and getting some exposure to Arduino programming, we are beginning to build the model. 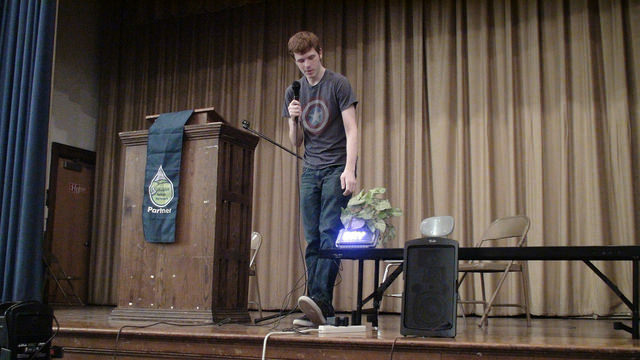 Kevin Magerr, an engineer with the Environmental Protection Agency (EPA), delivered the skeleton of the model: an acrylic box with different compartments for the soil/plants, electronics, and a water pump. Also joining us was Cara Albright, a PhD candidate with the Villanova Urban Stormwater Partnership. These experts helped guide the model’s development. One way to monitor the effectiveness of a green roof is to look at how much water it can hold. Above, we plan to install a tube that acts as a well in the system. It will fill up with water and we can use an ultrasonic distance sensor to capture the level of water in the well. We talked about how the sensor works—it uses sound signals that bounce off the surface of the water, operating much the same way a bat uses echolocation to detect its surroundings—and experimented with different sizes of tubes to determine the most accurate measurements. 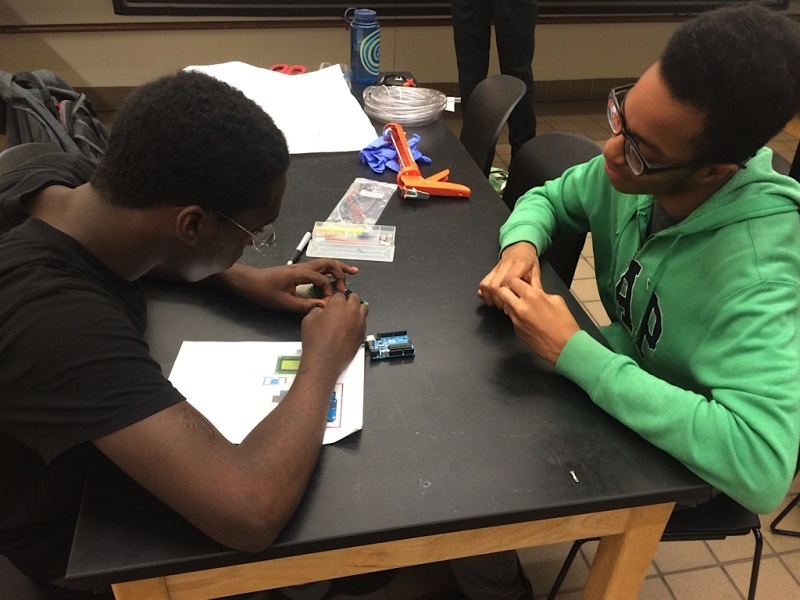 Terrance and Tyheim also began to wire an LCD display that will create a readout of the water level in real time. All of our prototyping is done with breadboards and jumper wires; once all the elements are in place, we will solder these circuits together to be able to look at multiple sensors and displays: water level, temperature, and soil moisture, for example. Fairmount Water Works is excited to partner with Matt Fritch and the Philadelphia Water Department to host four high school interns from Science Leadership Academy at Beeber. Chelby, Ashton, Tyheim and Terrance come to FWW weekly to meet with Matt, FWW educator Rachel O., and volunteer Billy K. We began the internship back in October, but we are just getting blogging now. Here are some observations from the past few months. Now it’s time to get to work. Matt is teaching us about Arduinos and how they are used to monitor different sites. Rachel is still trying to understand this, but she likes when Matt said that the Arduino is a really dumb computer. 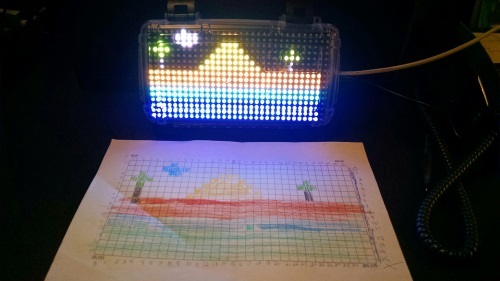 It can basically tell its sensor to do one thing: light on/light off, temperature readings, moisture, etc. 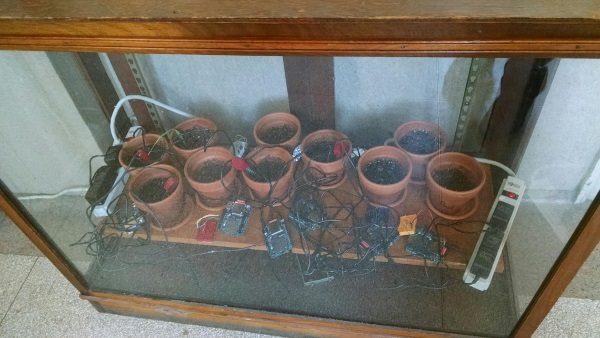 We’ll be using our Arduinos to connect to sensors to monitor soil moisture. To water or NOT to water? That is the question. We started learning about Arduinos and how to set them up to do different things. We learned to solder the appropriate parts. 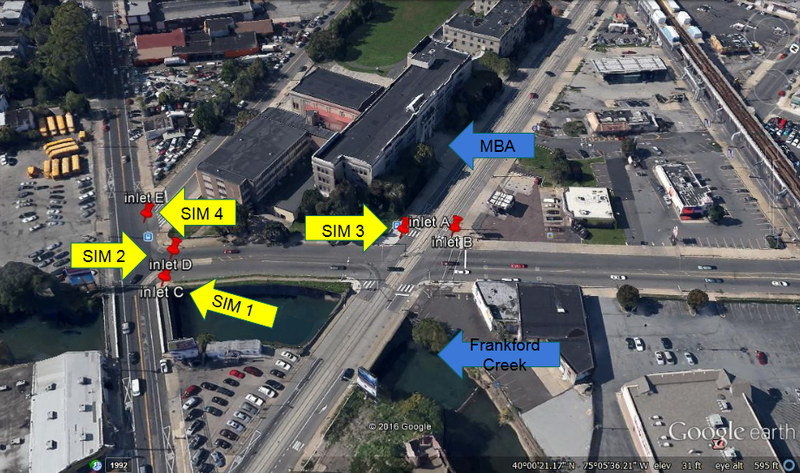 *We met on January 18 at Cira Green to look at the green roof. Rachel learned that the roof is designed to hold 500 people DANCING! She is hoping to get invited to that party. We now have to learn a bit more about how green roofs are constructed, so we spent a few days researching. 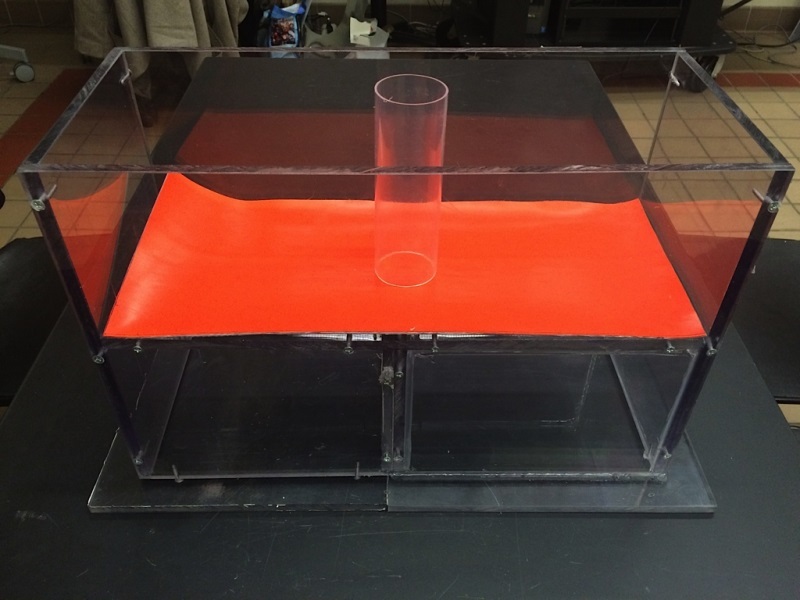 We’ll be making a model that can sit on a tabletop. Sensors will be incorporated into this model so we can tell the water level in the model. We have been practicing coding to make this sensor work. On Saturday, more than 20 middle-school girls gave up an unseasonably sunny afternoon to hack with Arduinos. 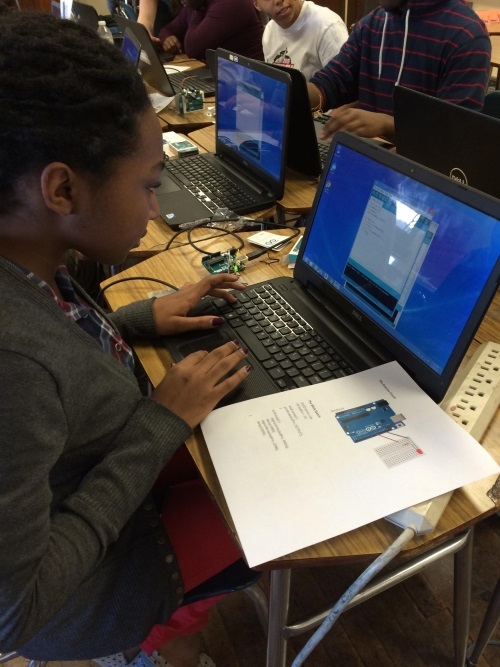 Philadelphia Water’s greenSTEM project hosted a free TechGirlz workshop at Moore College of Art to explain how low-cost electronics and sensors can be used to help the environment, improve our cities and neighborhoods, and connect the real world to the virtual world. We hit the ground running by setting up with Codebender, a browser-based Arduino programmer that takes much of the pain out of installing software, drivers and libraries on two dozen different computers. 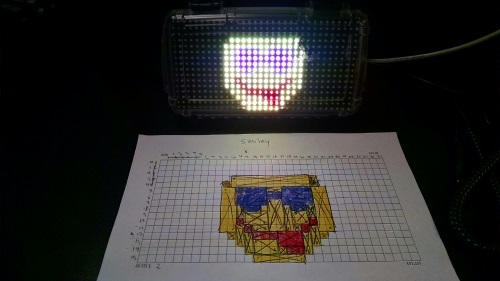 We quickly moved to a modified version of the Arduino blink activity and then tackled an art project: programming designs onto a 16×32 LED matrix sign using an x,y grid, geometric shape codes and color codes. This was hard work—many lines of code were written with intense focus. Thanks to the girls for attending, to our TechGirlz volunteers, and to Moore College for providing the space. The weekly classes we taught at Science Leadership Academy’s Beeber campus this past spring took place with the support of Seed Project funding from Drexel University’s ExCITe Center. Last Friday, we set up one of our students’ birdhouses there for visitors to see. Ninth grade students Abdul and Cinque designed this birdhouse for a cardinal. They incorporated the plastic walls because their research indicated that cardinals prefer open nests, and they thought the plastic would give the house a more open feel. For style, and in representation of Abdul’s religion, they etched an Islamic pattern into the plastic. 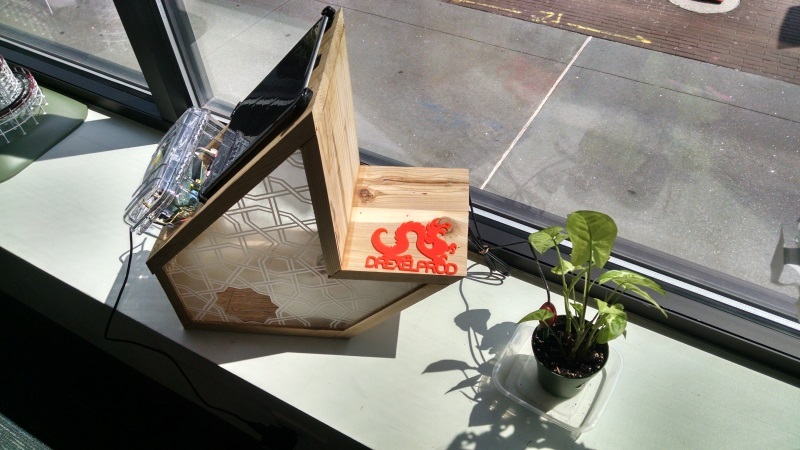 This birdhouse reads the soil moisture levels in the plant beside it. Inside we placed a small egg where the birds would normally nest. If you’re at the ExCITe Center, you can check out the video feed here. The ExCITe Center’s funding allowed greenSTEM to develop this year’s birdhouse project and teach students to program Arduinos and apply technology to environmental problems. This birdhouse is one of four designs created over the course’s 16 weeks. Each design incorporated solar power and datalogging via a wifi connection. In addition, all birdhouses have two rooms—one for birds, and one for electronics. The infrared cameras capture HD video of the birds inside the houses and stream it live to computers inside the schools for several hours each day. 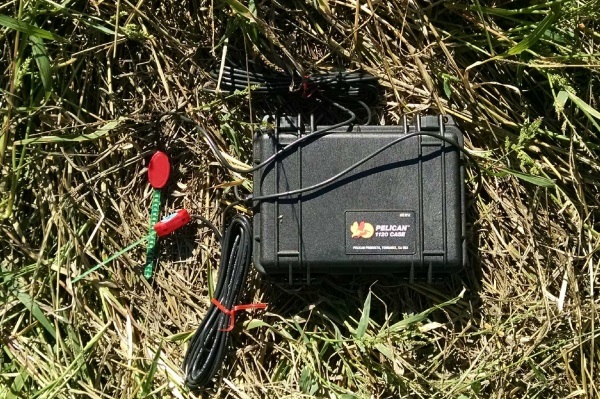 They also take temperature and soil moisture readings. The temperature data indicates how comfortable the birds are inside their home, and the soil moisture levels indicate when school gardens require watering. 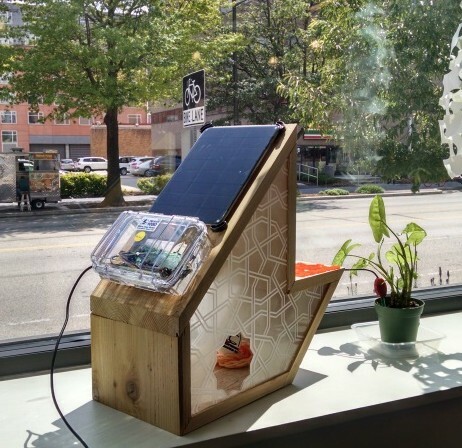 The birdhouses use low-cost technologies such as the Arduino microcontroller and the Raspberry Pi single-board computer. 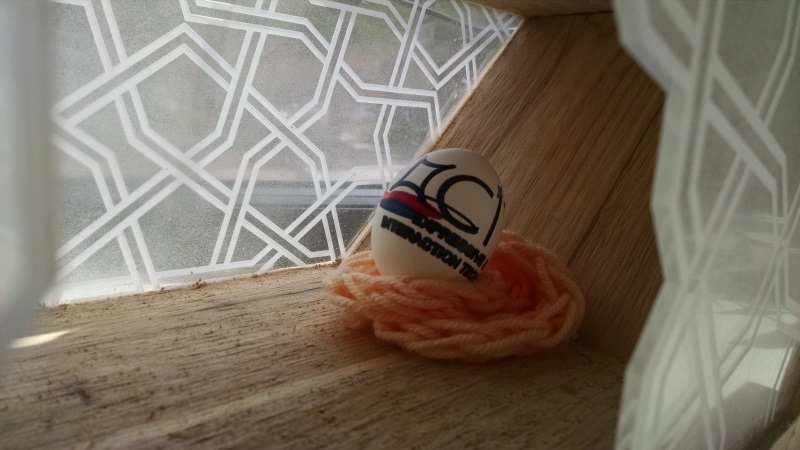 Because the ExCITe Center’s new birdhouse is hooked up to a steady internet connection and power source, we currently have it streaming during the entirety of the center’s hours of operation. 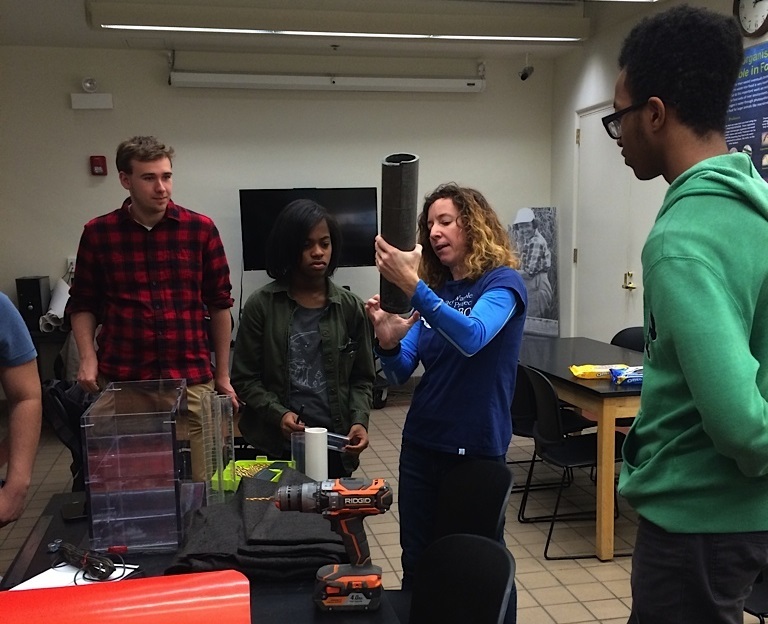 Philadelphia Water staff collaborated with the Fairmount Water Works, Public Workshop and Jarvus Innovations. Drexel University undergraduates Darya Dragun, Marika Zeldenrust and Alexandra Jones, along with Temple intern Olivia Williams, were key contributors to the project. Plans are already being hatched (no birdhouse pun intended) for next year’s greenSTEM project. On Monday, the Schuylkill Action Network gave SLA Beeber students the 2015 Scholastic Drinking Water Award. 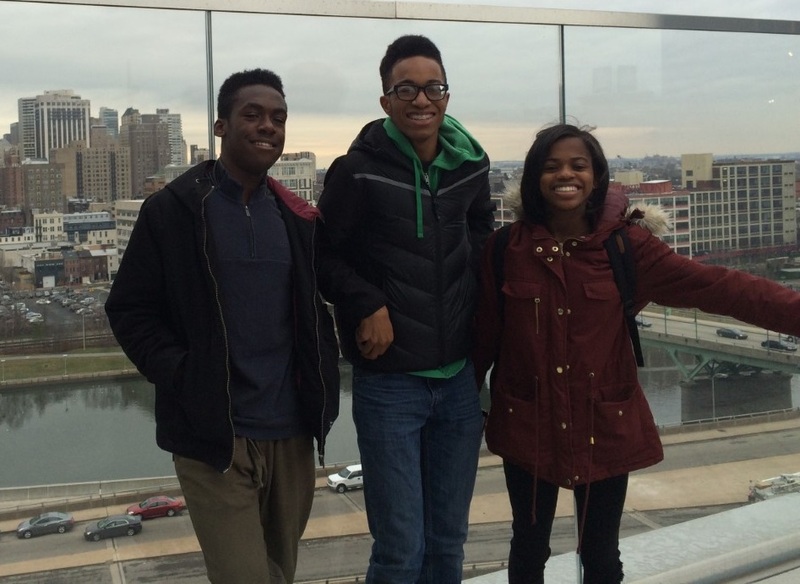 The 9th and 10th graders have worked with the Philadelphia Water Department’s greenSTEM project in weekly courses. SLA Beeber was one of three award winning schools across the Schuylkill River Valley. Schools that have won the award in the past have demonstrated exemplary stormwater management practices, or conducted class projects or educational programs pertaining to clean water. 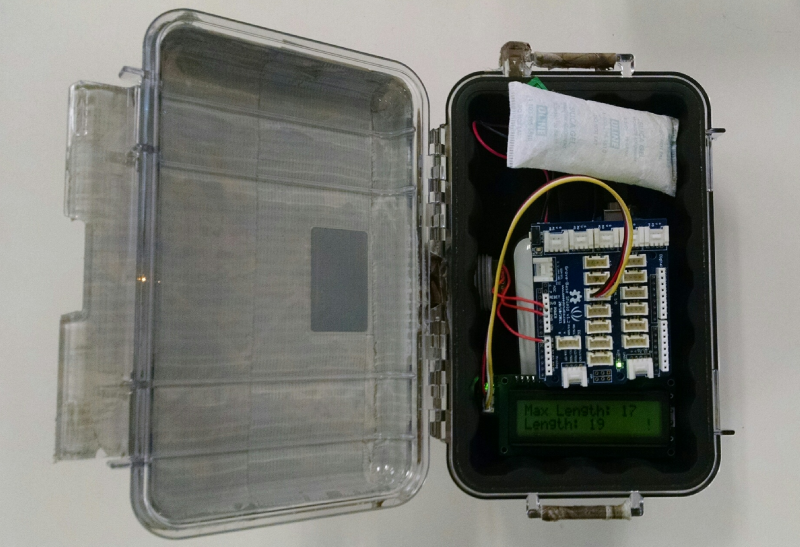 SLA Beeber won this year’s award for participating in our Root Kit project, where they programmed Arduinos and sensors to monitor and record soil moisture data. 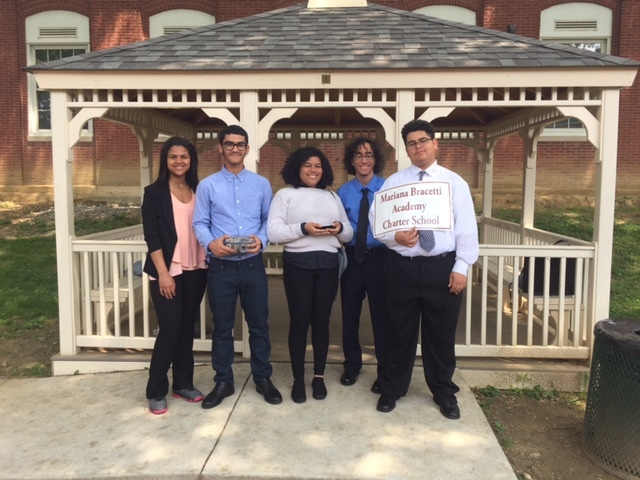 The high school hosted an assembly to honor these students for their hard work, which was attended by representatives from the Schuylkill Action Network, the Environmental Protection Agency, and the Partnership for the Delaware Estuary. Several of the students spoke about their work with the Root Kits and explained what they had learned about the importance of protecting drinking water through green stormwater infrastructure and visits to the Fairmount Water Works during their mini-courses with PWD. Jon Capacasa, director of the the Environmental Protection Agency’s Water Protection Division, spoke about the importance of collaboration with students and educational facilities to help protect drinking water and presented the group with a plaque commemorating their achievement. 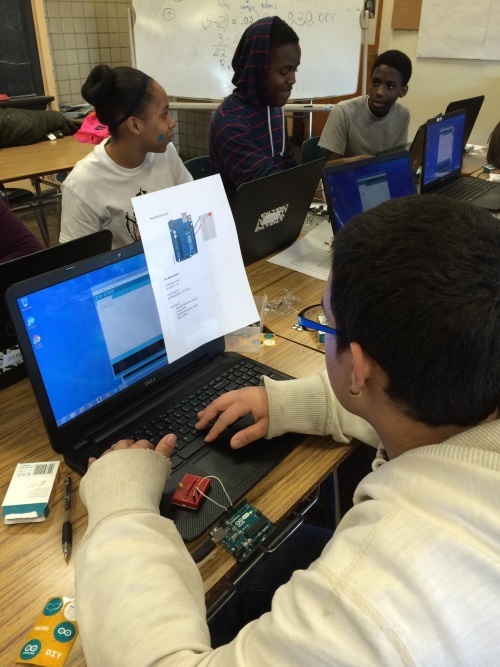 At Science Leadership Academy’s Beeber campus in Overbrook, 9th grade students are learning to program Arduinos to collect soil moisture and sunlight data. The course began with a trip to the Fairmount Water Works to get some background on Philadelphia’s water history, its present challenges due to stormwater and combined sewer overflows, and the plan for an environmentally sustainable future. On the tech side, we’ve covered Arduino basics, Ohm’s Law, simple circuit design (in the photos above, Fritzing came in handy to help students visualize circuits), and the principles behind soil moisture sensors and photocells. In the coming weeks, we’ll figure out more attention-grabbing ways to make sure students are looking after the plants. (And perhaps a solution to that mess of wires.) 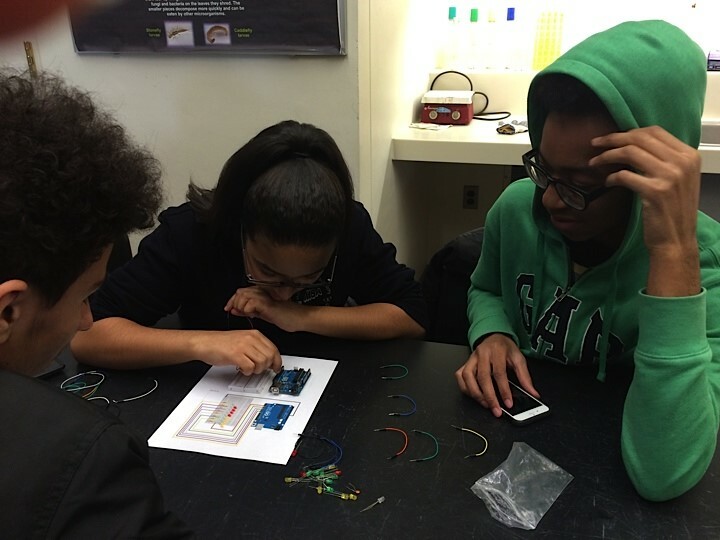 Thanks to Drexel University’s ExCITe Center, whose Seed Project funding brought all the electronics and sensors into the classroom. As the third and final part of our interactive plant display at the Fairmount Water Works, our last plant is now able to talk. That is, it can express its need for water through audio. This setup uses an Arduino ($25), a Wave Shield ($22), and a Vegetronix VH400 soil moisture sensor ($37). 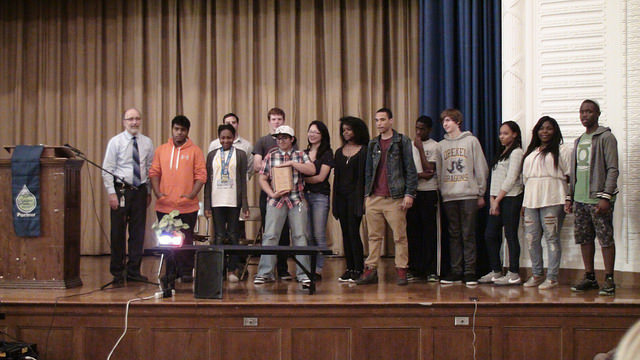 Our two 10th grade Science Leadership Academy students had a lot of fun soldering and building the shield. To our delight (and surprise), it actually worked the first time we tried it. The audio shield will only play .wav files. There are databases with huge amounts of them out there on the Internet. We faced some issues with our .wav files and their compatibility with the device, but after some practice, we began to get the hang of it. If the moisture level is not satisfactory, it will play water droplet sounds, indicating it needs to be watered. There’s a lot of room for creativity here, because iTunes and Audacity can convert .mp3 to .wav files. What’s stopping Matt from recording himself, converting it, and uploading it to the Arduino? Nothing—he’s probably already started working on it. View the code after the jump. 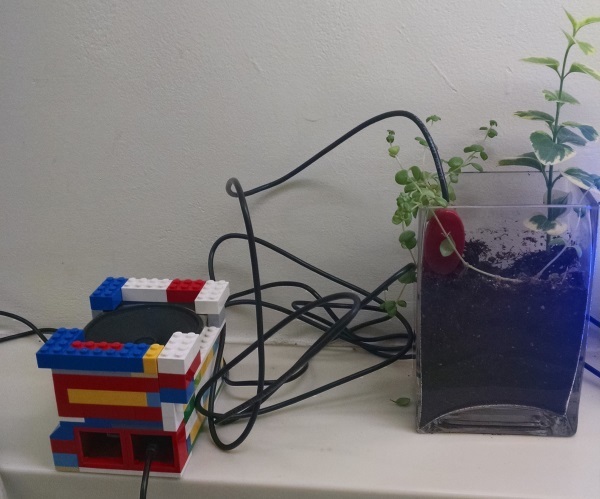 This setup uses an Arduino Uno ($25), a WiFi shield ($80), and a Vegetronix VH400 soil moisture sensor ($37). 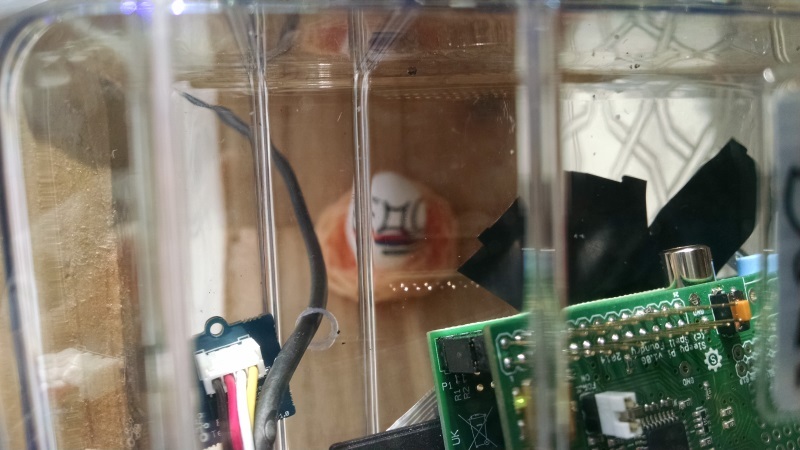 This WiFi shield has an integrated antenna, which allows us to connect to the wifi at the Water Works and send tweets over its network. “Water me please!” when the moisture value falls below 250. “URGENT! Water me!” when the moisture value falls below 150. “Thank you for watering me!” when there is a change in moisture level of at least 100 and the new moisture value is above 250. “You didn’t water me enough!” when there is a change in moisture level of at least 100 and the new moisture value is below 250. “You overwatered me!” when the moisture level climbs to above 400. One problem we ran into was that Twitter doesn’t allow repeated tweets, as a way to block spam. Because of this, we had to add more content to our tweets. In addition to the text, each tweet displays the moisture level and the tweet number (we added a tweet counter in our code). 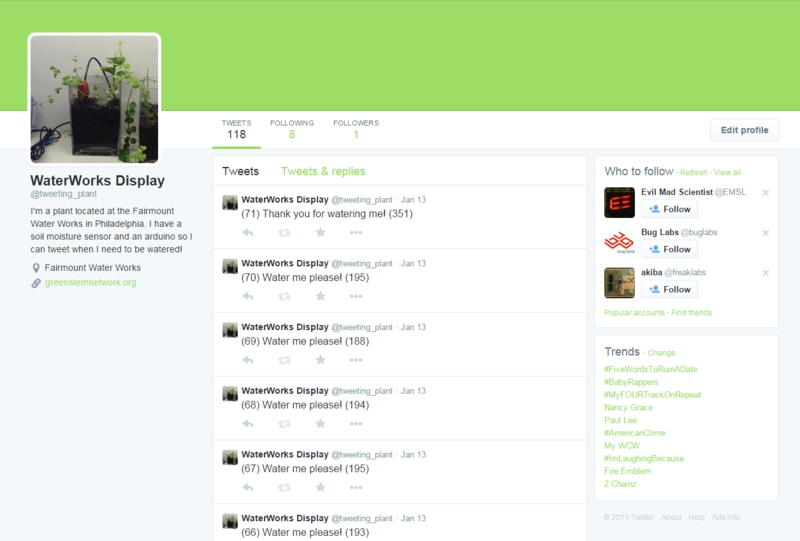 You can see our plant’s tweets here.